Yay, a movie I've been waiting for. Rachel Getting Married (2008). Anne Hathaway is my favourite actress ever and I've watched all of her films, and because she was nominated for an Oscar for this, I thought this would be great. And it...was. I was sucked in from the very moment it started, mainly because I have a soft spot for indie dramas. 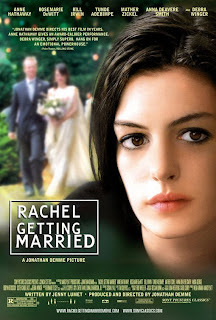 Really, the story of this film is Rachel getting married, and all the dramas that happen with it. Jonathon Demme is a great director, and considering that he directed The Silence of the Lambs (1991), this film had to live up to high expectations. Obviously, it didn't work for some people. One of the employees at Blockbuster said that it was 'pathetic' and it was 'the worst film Anne Hathaway's been in'. And when I asked another employee if they'd seen it, they put on a 'why the hell would I want to watch that?' face and said no. Well I wouldn't to say to them, "Maybe because it is that you don't take movies seriously enough and your brain only takes in so much from a movie that it fries." Well, each to their own, but this is only for fans of family dramas. It really is not all that bad. Quite heart-breaking if you ask me. And Anne Hathaway sure did deserve that Oscar nomination!